Residence 12L at 330 Third Avenue is a large alcove studio with excellent closet space in this exceptionally maintained Kips Bay co-op. Upon entry, a spacious foyer welcomes you to the well-appointed home and offers the space for a dining table. The updated kitchen features terrific counter and storage space complete with stainless steel appliances. A sizable dressing area provides enough storage for all seasons and flows directly into the modernized bathroom boasting a multi-zoned shower head system. The living area offers flexibility and can be configured based on ones preference. Currently furnished with a queen sized bed, space allows for a king. 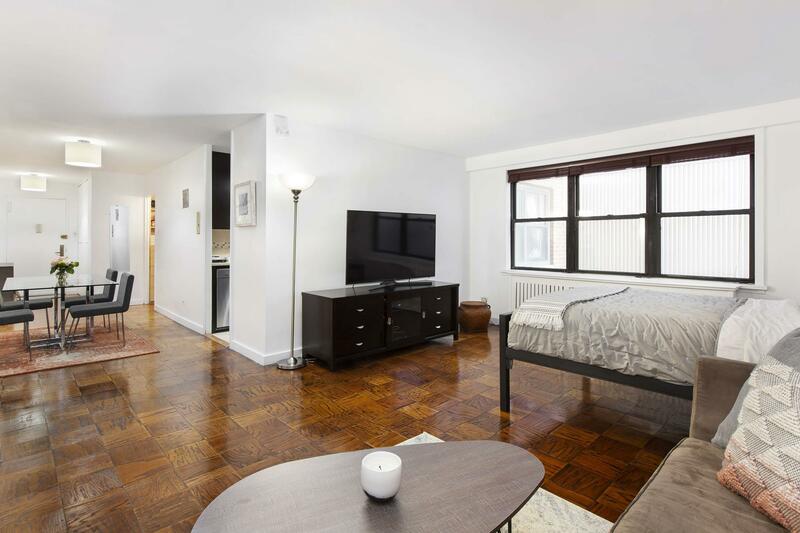 Positioned away from the street, the apartment is pin-drop quiet and is a must see for the discerning buyer.330 Third Avenue is a full-service co-op building offering a 24-hour doorman, live-in superintendent, laundry room and updated common areas. On-site parking, storage and bike room available at an additional cost. This co-op considers pied-à-terres, co-purchasing, gifting and dogs up to 40 pounds. Subletting is permitted after two years of ownership for up to four years. Accessible transportation options within blocks, including 6, N/R/W, F/M and PATH trains.